Although it’s the baby of our fleet, MY Blue Planet 1 is a fast, spacious and beautifully fitted out. 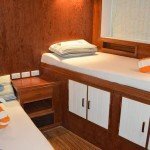 A friendly boat and ideal for smaller groups who would like to explore the Northern Red Sea from Hurghada. 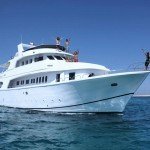 Built in 1999 and fully refitted and upgraded in July 2013, the 27 meter MY Blue Planet 1 offers you the opportunity to dive the famous itinerary of the “North & Wrecks” as either a 3 night mini safari combined with resort or, for groups, a 7 night itinerary, departing from Hurghada. 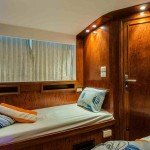 Accommodating up to a maximum of 15 guests MY Blue Planet 1 offers 8 twin bed cabins all en suite and all with A/C. 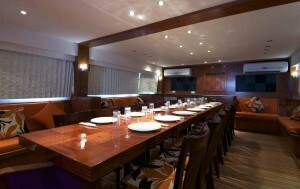 There’s a comfortable lounge and dining area equipped with TV, DVD and CD player. Outside you can find a spacious shaded cushioned sun deck and 2 sunbathing platforms allowing ample space for relaxation. 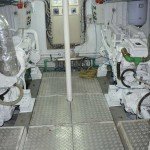 The well-designed and recently refurbished dive platform offers a charging station for your torch and camera batteries, equipment rinsing facilities and on deck showers. 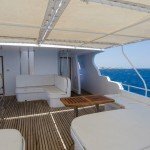 Included within your charter are 3 freshly prepared meals per day, selected snacks between dives, bottled soft drinks, mineral water, tea and coffee. 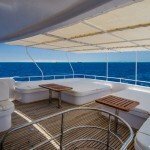 Extras available to purchase on board are local wines, beers, mixers and diet drinks. 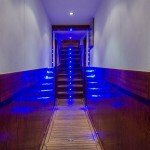 Upon arrival you will be led aboard and receive your boat briefing whilst your evening meal is being prepared. 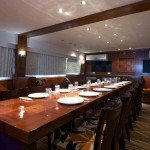 During dinner you have the chance to meet your fellow divers and chat about the reefs you’re likely to visit. The following morning after breakfast MY Blue Planet 1 aims to leave port between 8am and 9am, but departure time is in the hands of the coast guard so please allow an hour either way. Marine parks as Brothers, Daedalus, Rocky and Zabargad require at least 50 dives and Advanced Open Water or equivalent. Transportation: From Airport – Ship – Airport included. Information: After Arrival in Hurghada you will be transferred to the boat. 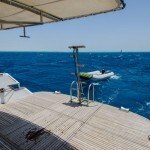 Routes: MY Blue Planet 1 offers North, Tiran, Brothers and Wreck Routes. Speed: 10 bis 12 Knotes. Engines: 2 x 600 MAN. Generators: 2 x 45 kW. Water Supply: 6.000 litre & 2 x Desalination-Plan 3678 litre/day sea. Navigation: Radarsysteme 36/48n.m.2 Echo sounder, 1 GPS Color LCD Sounder, Chart plotter. Communication: 3 Radiotele, HF, SSB, DSC, GSM Telefon, VHF. Safety: 2 x Life rafts each for 20 Persons. First Aid: 2 x 50 litre Oxygen Tanks + 2 DAN oxygen kit. Equipment: 25 X 12 l. Aluminium tank, INT and DIN. 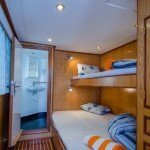 Facilities: 8 twin bed/double bed cabins with en suite bathroom and air-con. Salon with air-con, 2 sun decks. Diving: 2 x Bauer Compressor (Mariner 200 litre/min). In terms of safety, the MY Blue Pearl is equipped with Rescue Radios Nautilus Lifeline.